Science has always played a big part in their lives. In fact, they met in high school chemistry class. Molly jokes that she didn’t learn much that year since the boy she was crushing on was just a seat behind her. Travis cemented their flirtations into a “real” relationship when he made her a mixed tape. They’ve been together ever since–even with a two-year long-distance stint during their undergrad. But like any good man will do, Travis followed Molly to Truman so they could be together. But long distance is once again a challenge they are hurdling this last year before marriage. Travis is a toxicologist in Columbia, MO., and Molly is here in Kansas City in dental school. But even with their busy schedules so far apart, they make sure to fit in time on the weekends to cook meals together, eat said meals, and then cap off the meal with ice cream or coffee somewhere close by. After spending just a bit of time with them, it really is clear that even if CHEMISTRY brought them together, their strong friendship has solidified their bond. And did I mention they are super cute??? Speaking of cute…. let’s get on with the pics…. Usually the guy starts off the engagement session being a bit tense, and unsure of himself or the directions that are coming out of my mouth. But not Travis. He “got it”… and sometimes, the two of them needed NO direction because they fell into one another with ease. But we didn’t care…cuz there were plenty more possibilities. 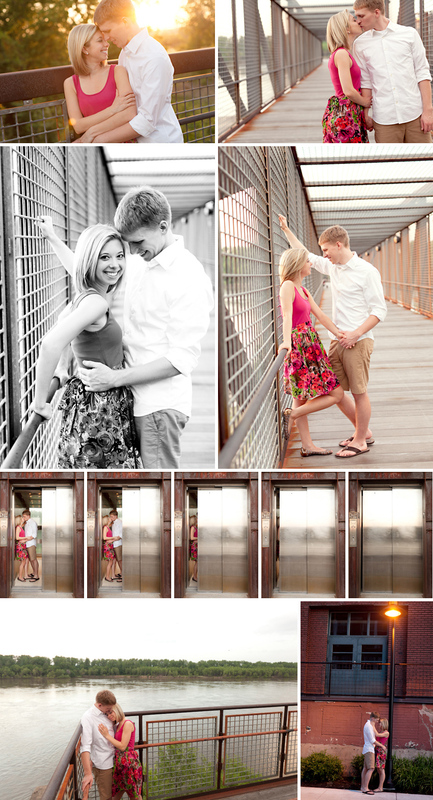 They were darling with the Save The Date idea… I quite enjoyed them trying to figure out what silliness to do next. How yummy are the colors in these??? I’ll tell you how yummy! I WOULD EAT THEM!!! AND ENJOY IT!! AND THEN WANT MORE!! !